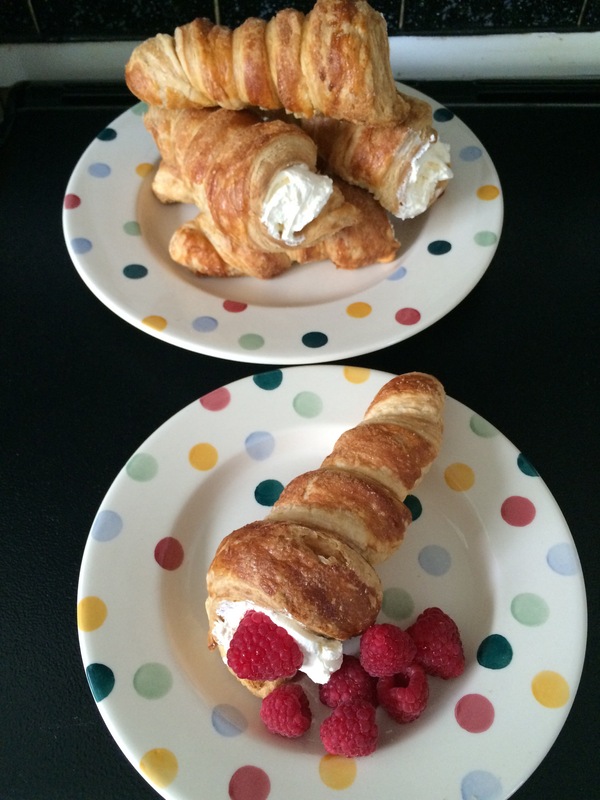 Cream horns are the kind of thing I used to be given as a treat when I was little – a posh and indulgent cake from the local bakery. Sugar-encrusted puff pastry filled with whipped cream is a simple thing, but done well it’s a thing of beauty. 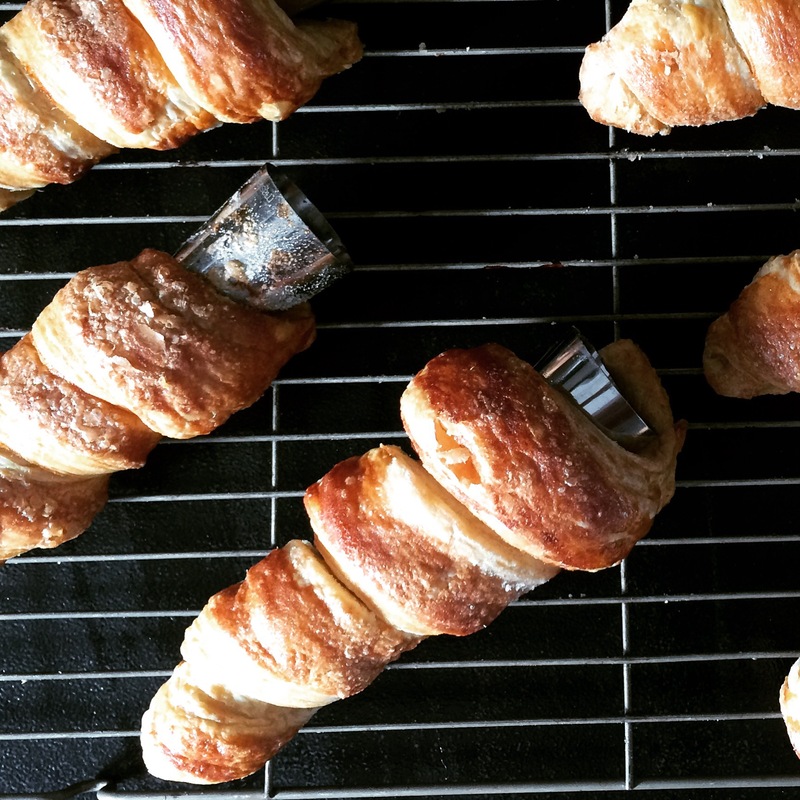 Cream horns in themselves are not complicated: you simply wrap sugared puff pastry around a cream horn metal mould (who knew such things existed? Apparently my mum had some which she used to use to make her own, but she’s not sure exactly where they have ended up), then baked in the oven until cooked all the way through, allowed to cool and filled with creamy goodness. As they sounded simple, I’d been successful in making reverse puff pastry a few weeks ago for Arlettes, and I needed some puff pastry for last week’s pie, I decided to make my own puff pastry for the first time. 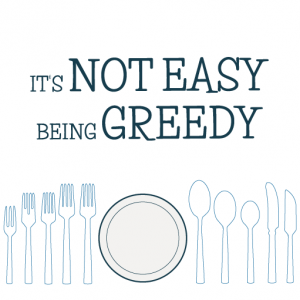 The finer details are explained in last week’s post. Last week’s puff pastry pie lid tasted really good but was lacking in the aesthetics department, so I wasn’t holding out much hope for the cream horns. I even went as far as buying a pack of Jusrol from the local supermarket so that I could make a second batch if the homemade version proved impossible. I needn’t have worried – the puff pastry served me well. What I discovered is that raw homemade puff pastry survives for a week in the fridge, so it’s definitely worth making up a big batch of the stuff if the desire overtakes you to make your own. 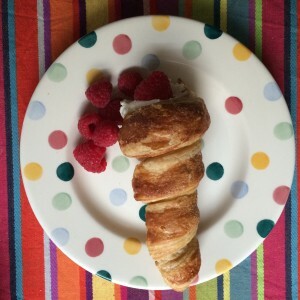 I also discovered that cream horn moulds aren’t that easy to wrap puff pastry around, and that unless you roll the puff pastry very, very thin, it takes an awful long time to cook. However, despite a few moments of doubt during the baking process, I was very pleased with how my cream horns ultimately turned out. And by the way, because of my holiday to Las Vegas I had to bake and write the post for this challenge without having seen the show, hence my lack of knowledge in a lot of aspects of this bake! Firstly roll out your pastry into a thin rectangle – you need enough of a length to be able to wrap it around the cream horn moulds. I guess mine was around 40cm long and 12cm wide. Cut the pastry into long strips of around 2cm each and wrap them around the moulds (I’d wiped mine over with vegetable oil to stop the pastry from sticking to the mould), starting at the thin end and working your way out. You need the strip to overlap the previous one slightly on its way around – sorry I was so preoccupied in doing this that I forgot to take pictures. Once you have wrapped each mould with pastry, brush it with a beaten egg, sprinkle with sugar and lay onto a lightly greased baking traybake in an oven which has been pre-heated to 170 degrees. I debated standing the moulds upright on the baking tray like a row of cones but I was a bit concerned that as the pastry heated it would roll down the moulds and end up in a heap at the bottom so I didn’t risk it – let me know if that was the right thing to do! 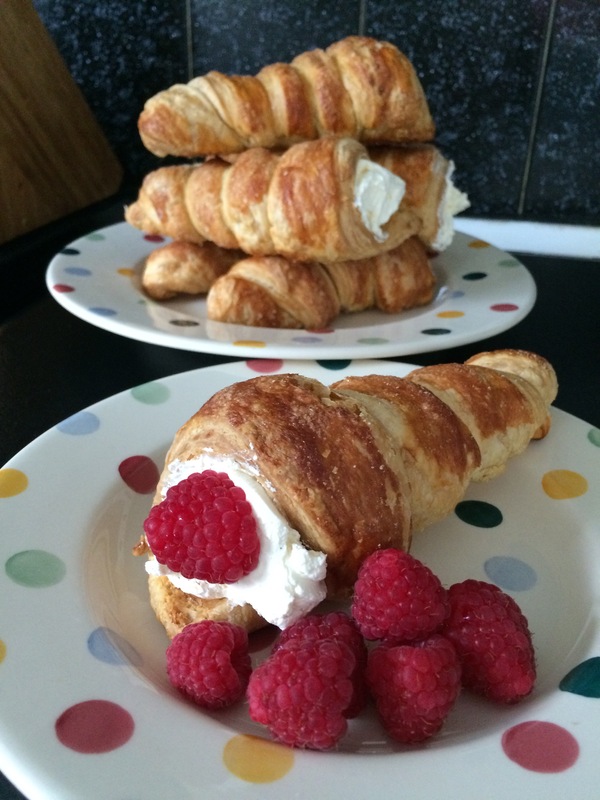 How long to bake the cream horns for is also up for debate – mine took a good 40 minutes to cook through, but I think that is because I rolled the pastry too thickly and so they took ages to cook inside. Hopefully if you roll your pastry more thinly it won’t take so long – I should imagine that around 20 minutes would be about right for correctly rolled pastry, but it’s actually quite easy to slip the moulds out from inside the horn to check if they are cooked inside – when they are you’ll know they are done. The extra baking didn’t do mine any harm, and I think the golden colour they baked to is very attractive. When the horns are baked through then take them out of the oven and allow them to cool on a cooling rack. I left them overnight and piped them the next day full of the cream which I had whipped with the icing sugar and vanilla bean paste to make a chantilly cream. Then I popped some raspberries on top and around the side of the plate before serving. 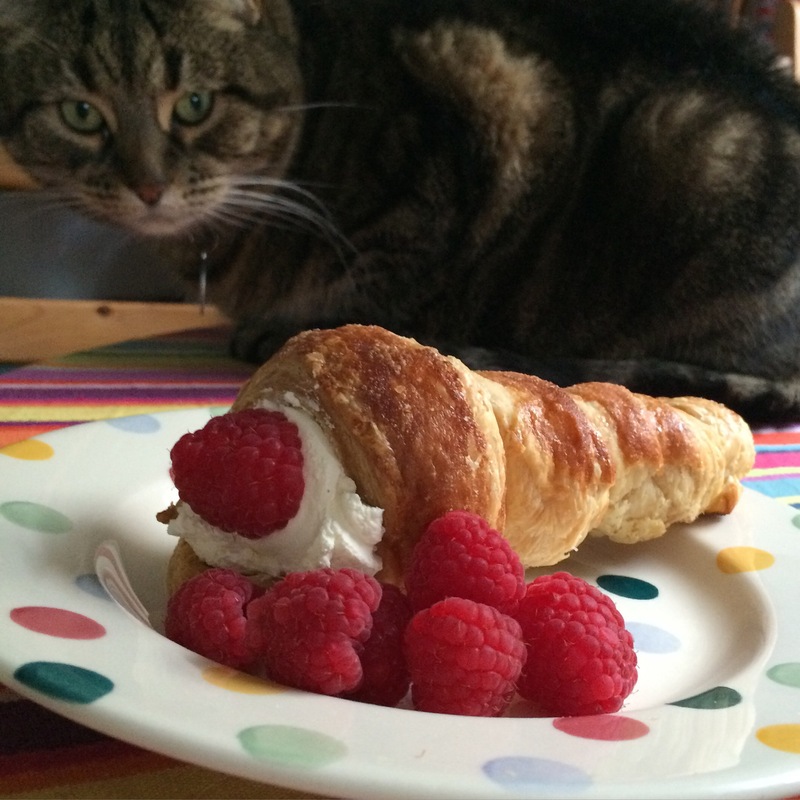 Not only did the cream horns look very pretty (you can see Betty was keen on the idea of getting her paws on one) but they tasted really gorgeous. I think homemade buttery puff pastry makes all the difference, and would recommend you make your own if you can find the time. 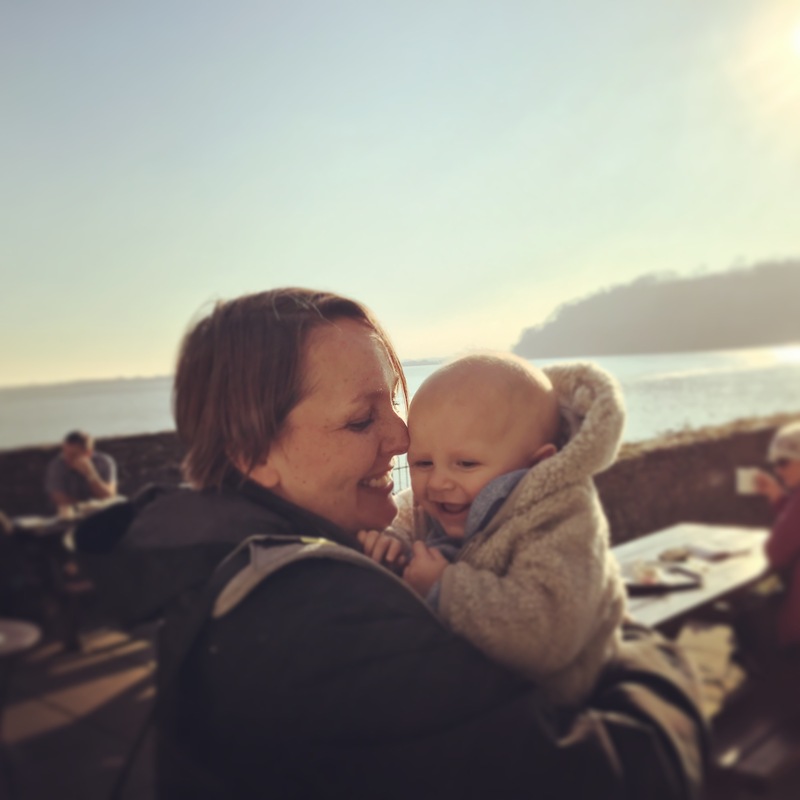 As usual I am participating in the following challenges – find out more by clicking on the links below. Your cream horns look so good, lovely colour on the pastry and the swirls are excellent. Not sure I have ever had a cream horn but that will have to change ASAP! 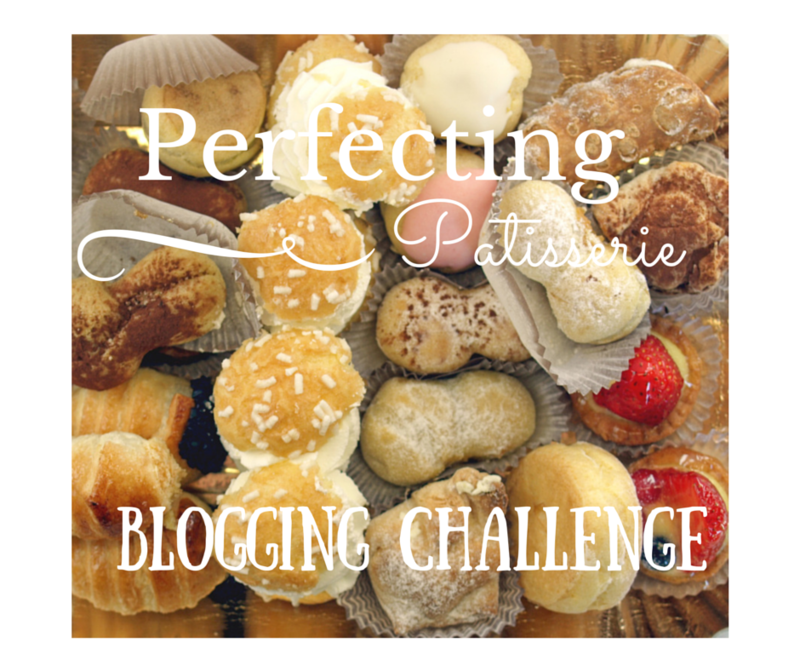 Thank you for joining in with Perfecting Patisserie! Thanks! I expected the worst so was really pleased with how they turned out. i must make my own puff at some point i have avoided it so far! 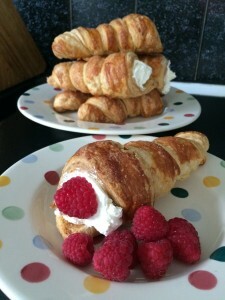 They are lovely with a dollop of jam/lemon curd put into ‘horn’ before adding the cream. Scrummy!